At today’s community rally to save Dawn Fraser Pool I announced that an elected Federal Labor Government would commit $2 million to restore one of Australia’s oldest swimming pools and most precious heritage assets. Dawn Fraser Pool is loved by many Australians, but without an urgent heritage restoration we may see the doors of our famous Baths closed forever. 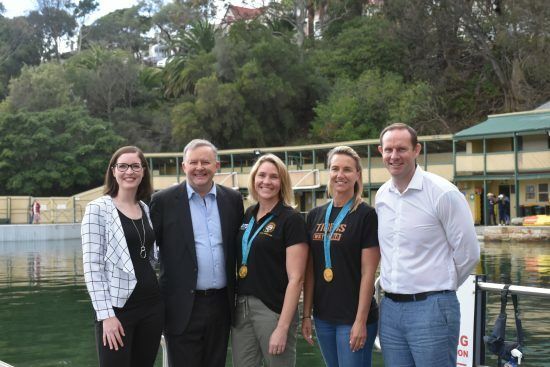 Federal Labor’s $2 million commitment, in addition to the $4.5 million already dedicated by the Inner West Council and the $1 million announced today by the NSW Labor Opposition will provide the funds needed for a full refurbishment of the Baths. In 2016 at the Federal Election I stood with the community and committed funding towards the renovation of the Baths. Subsequently, the Inner West Council has completed a Master Plan for the Pool that identified urgent works needed to make the facility safe and accessible for the public and sporting clubs. Our increased funding commitment is in recognition of how precious Dawn Fraser Pool is and its value to the community. For more than 130 years children have learned to swim at these baths. The Balmain Water Polo and Swimming clubs, who also call the Baths home, have produced multiple Australian representatives and Olympic gold medallists. It’s time to make sure that this proud history is carried on at Dawn Fraser Pool for another century to come.